Brian Gunia is an expert on negotiating, and he does something unusual here: he offers insights about bargaining that are both novel and useful. We use money to solve our everyday problems, and it generally works well. Despite its economic benefits, however, money has a psychological downside: it trains us to think about negotiations narrow-mindedly, leading us to negotiate badly. Suggesting that we need a non-monetary mindset to negotiate better, The Bartering Mindset shows us how to look outside the monetary economy – to the bartering economies of the past, where people traded what they had for what they needed. The book argues that, because of the economic difficulties associated with bartering, barterers had to use a more sophisticated form of negotiation – a strategic approach that can make us master negotiators today. This book immerses readers in the assumptions made by barterers, collectively referred to as the "bartering mindset," and then demonstrates how to apply this mindset to modern, monetary negotiations. 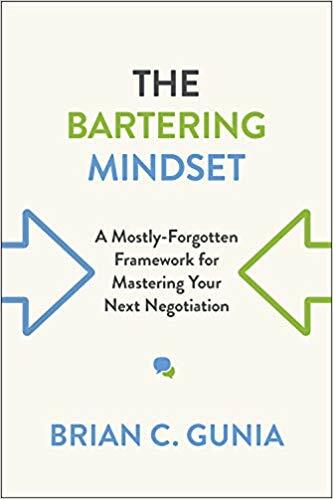 The Bartering Mindset concludes that our individual, organizational, and social problems fester for a predictable reason: we apply a monetary mindset to our negotiations, leading to suboptimal thinking, counterproductive behaviors, and disappointing outcomes. By offering the bartering mindset as an alternative, this book will help people negotiate better and thrive.